Ron Dellums' proposal for two new ballpark sites in Jack London Square might block the team's planned move to San Jose, while providing a financial boost for Oakland. City of Oakland By unveiling new ballpark sites, the mayor and his allies outflanked A's co-owner Lew Wolff. Ron Dellums was boxed in. It looked as if the Oakland A's were going to move to San Jose, possibly on his watch. All team co-owner Lew Wolff had to do was convince Major League Baseball that there were no viable ballpark sites in the East Bay. But then Oakland's much-maligned mayor made some shrewd moves of his own. 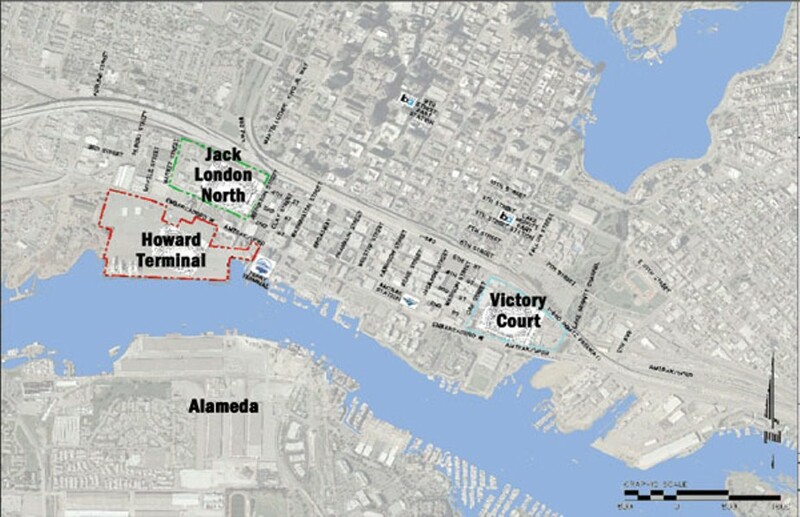 Dellums and a group of city leaders found two new stadium sites in the Jack London Square district that not only undermine Wolff's plan, but also promise to be a substantial boon to the city if either becomes the A's new home. Indeed, the deft political moves Dellums exhibited in the past several months in dealing with the A's were reminiscent of the former longtime Congressman's years in the nation's capital — and not of his first two years as mayor. If successful, Dellums also will have accomplished what his predecessors had failed to do — find the A's a new ballpark while revitalizing the city at the same time. Maybe it shouldn't be surprising. At a press conference last week, the mayor waxed nostalgic for his days as a youth watching the old Oakland Acorns baseball team, while sitting in the ten-cent bleachers. "If I had my druthers," he told the media, "I would have ended up a major league pitcher, not a politician." Readers of this column know that Full Disclosure has often been critical of using public money to prop up private enterprises. But the proposal for a new A's ballpark in Jack London Square provides a clear example of the difference between a good deal and a bad one. The city, for example, will not tap into its general fund, which is needed to pay for police, fire, libraries, and parks. Instead, it would use redevelopment funds that are specifically designed to help Oakland revitalize itself. Dellums also vowed that those funds would only be used to assemble land, build infrastructure, and provide for parking, just as the city would do for other large developments. And finally, the mayor said the city would spend no money on the stadium itself, which would be expected to cost more than $400 million. Dellums wouldn't say how much redevelopment money the city would commit to the overall project. But even if it's $100 million, it's still a better bargain than what the city has received elsewhere. In the Uptown district, for example, Jerry Brown handed over more than $60 million in city subsidies to Forest City and only got about 600 apartments, many of which have still not yet been rented. The city would have been much better off if it had pursued former City Manager Robert Bobb's proposal for an A's ballpark on the same site instead. The city also has spent about $50 million in redevelopment funds restoring the Fox Theater in Uptown. But, like the ballpark proposal, that expenditure is much easier to defend because the Fox remodel has created a substantial buzz for Uptown and helped make it a destination spot. Similarly, a stadium in Jack London Square could finally turn that district into a true regional destination, especially with the major renovations and substantial private investment in the square in the past several years. Eric Angstadt, Oakland's deputy director of economic development, said private investors have put at least $3 billion into the Jack London area in the past decade. In fact, when you think about it, Jack London Square is a perfect spot for the A's. It's close to the water and families have been comfortable visiting the area for years. In that way, it's one of the few places in Oakland that has enjoyed regional appeal, along with the Coliseum, Lake Merritt, the Oakland Zoo, and the Chabot Space & Science Center. As such, a ballpark would be a natural fit there. The plan also already has the support of local business leaders. Backers include both Michael Ghielmetti, president of Signature Properties, which plans to build 3,000 condos on the Estuary, and Jim Falaschi, who is co-developer and co-owner of the Jack London Square waterfront and is in the process of transforming it into an upscale foodie destination. Not surprisingly, Ghielmetti said last week that he favors the proposed Third and Oak streets site, which would be directly across the Embarcadero from his proposed Oak-to-Ninth housing development. But Dellums perhaps deserves the most credit for outmaneuvering the A's politically. Earlier this year, Wolff's plan to move to San Jose looked like it might have some legs. It was predicated on the argument that there were no viable spots in the East Bay for a new ballpark. And, for a while, it appeared that he might be able to make that case. After all, Brown and Oakland city leaders had showed no interest in his plan for a ballpark and housing development just north of the Coliseum. In addition, Wolff spent millions buying land and developing a ballpark proposal for Fremont, and yet both of his preferred sites were met with fierce criticism by area businesses and neighborhood groups. And so when he abandoned his Fremont plans in February, it looked as if he might be able to convince baseball that he had no other place to go in Northern California other than San Jose. Making that argument was essential because to move to San Jose, Wolff would have to convince three quarters of the team owners to strip the San Francisco Giants of their territorial rights to the South Bay. Wolff had one ace up his sleeve — his old college frat buddy, baseball Commissioner Bud Selig. But it was still a tough sell because baseball owners are reluctant to tread on other team's territorial rights for fear that it might happen to them. Dellums clearly understood these complexities of ballpark politics when he teamed up with City Council President Jane Brunner in March and the A's booster club, Let's Go Oakland, co-run by Oakland planning Commissioner Doug Boxer. They then smartly worked behind the scenes with baseball's task force to make sure that it analyzed the new Jack London Square sites and gave them a fair shake. "We believe that this has been a real process ... not a game, not a sham," Dellums said. So now, even if the task force recommends San Jose as the new home for the A's, it won't be able say there are no viable sites in Oakland, particularly when the mayor, council members, and city business leaders say the opposite. In other words, the prospects of baseball's owners deciding to take away the Giant's rights to the South Bay have suddenly become a long shot. And instead of Dellums being boxed in, it's Lew Wolff and the Oakland A's.